How to convert a tuna fish can into a fully functional, efficient, and cheap cooking device. There’s a whole array of camp and travel stoves out on the market — from butane to kerosene, white gas to solid fuel — and so many varieties of portable camping stoves available for sale that the once primitive act of creating fire to cook some beans in the bush has been turned into adventure in consumerism. 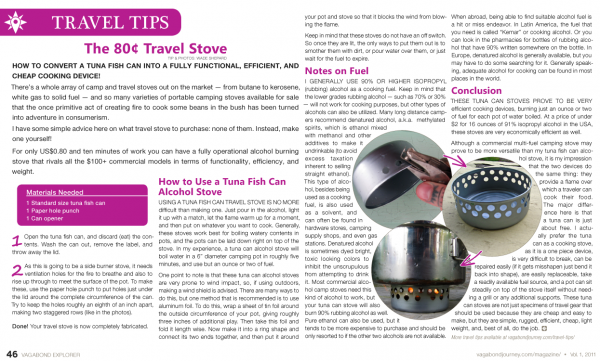 I have some simple advice here on what travel stove to purchase: none of them. Instead, make one yourself! 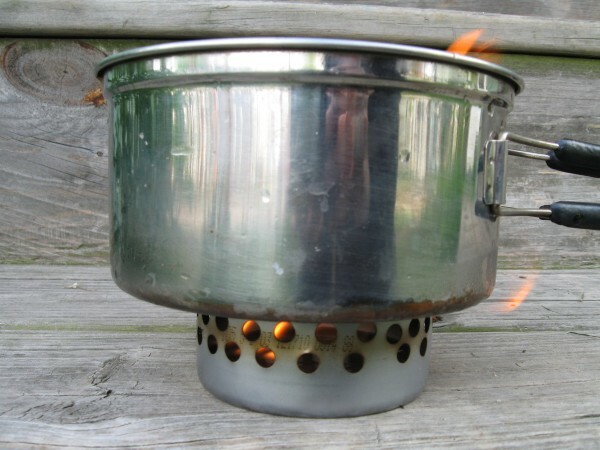 For only US$0.80 and ten minutes of work you can have a fully operational alcohol burning stove that rivals all the $100+ commercial models in terms of functionality, efficiency, and weight. Open the tuna fish can, and discard (eat) the contents. As this is going to be a side burner stove, it needs ventilation holes for the fire to breathe and also to rise up through to meet the surface of the pot. To make these, use the paper hole punch to put holes just under the lid around the complete circumference of the can. Try to keep the holes roughly an eighth of an inch apart, making two staggered rows (like in the photos). Done! Your travel stove is now completely fabricated. Using a tuna fish can trave l stove is no more difficult than making one. Just pour in the alcohol, light it up with a match, let the flame warm up for a moment, and then put on whatever you want to cook. Generally, these stoves work best for boiling watery contents in pots, and the pots can be laid down right on top of the stove. In my experience, a tuna can alcohol stove will boil water in a 6” diameter camping pot in roughly five minutes, and use but an ounce or two of fuel. One point to note is that these tuna can alcohol stoves are very prone to wind impact, so, if using outdoors, making a wind shield is advised. There are many ways to do this, but one method that is recommended is to use aluminum foil. To do this, wrap a sheet of tin foil around the outside circumference of your pot, giving roughly three inches of additional play. Then take this foil and fold it length wise. Now make it into a ring shape and connect its two ends together, and then put it around your pot and stove so that it blocks the wind from blowing the flame. Keep in mind that these stoves do not have an off switch. So once they are lit, the only ways to put them out is to smother them with dirt, or pour water over them, or just wait for the fuel to expire. What kind of fuel do I need? I generally use denatured alcohol or 90% or higher isopropyl (rubbing) alcohol as a cooking fuel. Keep in mind that the lower grades rubbing alcohol — such as 70% or 30% — will not work for cooking purposes, but other types of alcohols can also be utilized. Many long distance campers recommend denatured alcohol, a.k.a. methylated spirits, which is ethanol mixed with methanol and other additives to make it undrinkable (to avoid excess taxation inherent to selling straight ethanol). This type of alcohol, besides being used as a cooking fuel, is also used as a solvent, and can often be found in hardware stores, camping supply shops, and even gas stations. Denatured alcohol is sometimes dyed bright, toxic looking colors to inhibit the unscrupulous from attempting to drink it. Most commercial alcohol camp stoves need this kind of alcohol to work, but your tuna can stove will also burn 90% rubbing alcohol as well. Pure ethanol can also be used, but it tends to be more expensive to purchase and should be only resorted to if the other two alcohols are not available. When abroad, being able to find suitable alcohol fuel is a hit or miss endeavor. In Latin America, the fuel that you need is called “Kemar” or cooking alcohol. Or you can look in the pharmacies for bottles of rubbing alcohol that have 90% written somewhere on the bottle. In Europe, denatured alcohol is generally available, but you may have to do some searching for it. Generally speaking, adequate alcohol for cooking can be found in most places in the world. The video below shows how to make the cheapest and lightest camp or travel stove there is. This was the type of stove that I used daily to cook with as I traveled by bicycle across Iceland, and I keep one in my pack at all times no matter where I am traveling. Having the means to cook for yourself in travel makes you far more self-sufficient, gives you more dining options, and, in some parts of the world, is absolutely essential. I always travel with cooking gear, and because of this I am able to eat cheaper, healthier, and get sick less often. These tuna can stoves prove to be very efficient cooking devices, burning just an ounce or two of fuel for each pot of water boiled. At a price of under $2 for 16 ounces of 91% isopropyl alcohol in the USA, these stoves are very economically efficient as well. Although a commercial multi-fuel camping stove may prove to be more versatile than my tuna fish can alcohol stove, it is my impression that the two devices do the same thing: they provide a flame over which a traveler can cook their food. The major difference here is that a tuna can is just about free. I actually prefer the tuna can as a cooking stove, as it is a one piece device, is very difficult to break, can be repaired easily (if it gets misshapen just bend it back into shape), are easily replaceable, take a readily available fuel source, and a pot can sit steadily on top of the stove itself without needing a grill or any additional supports. These tuna can stoves are not just specimens of travel gear that should be used because they are cheap and easy to make, but they are simple, rugged, efficient, cheap, light weight, and, best of all, do the job. very awesome and useful tutorial. what do you typically cook? do you often have to refill the amount of alcohol in the tuna can? do you have to use a new one every time you cook? really resourceful of you. From what I can tell, each tuna can stove can be use hundreds of times. I used the one in this video around twice a day in Iceland for fifty something days, and it looks as if it can keep working indefinitely. In fact, other than being completely crushed or totally rusted I don’t know how one of these stoves could even be broken. If it bends, just bend it back into shape. I found that I could cook just about anything that I wanted to with it — rice, noodles, hot dogs, eggs. The amount of refills depended on the amount of wind that was present: the more wind, the more fuel I needed. Though I generally needed more than two refills to cook even noodles in high wind. I should have added a wind shield to my set up, but was a little lazy about it. With a proper wind shield — which can be made from aluminum foil — a good amount of fuel could be saved and the cooking time would be less. Hey Wade, I have been reading your blog for a while and love it. Keep up the good work. I just returned from a week long bike tour and used a homemade can similar to yours. I want to point out to your readers that just a clean, opened tin can will work (think cat food) if you have something to hold the cooking pot above the stove, which can be made from a thicker metal hanger or whatever else. Just pour the alcohol in and light it, then place the pot support and the dish. This works if there’s no hole punch or other tool available for making holes. Also, if no windscreen material is available, digging a hole in the dirt can do the same thing, if breathing room is left. A great resource is http://zenstoves.net and google. Thanks for these additional tips, Jack. Much appreciated. Wade, just wondering if you’ve tried the “penny alcohol” stove that one can make using a couple of 12 oz. soda cans? It appears to require a bit more time and elbow grease, but the flame seems burn cleaner, and more efficiently.